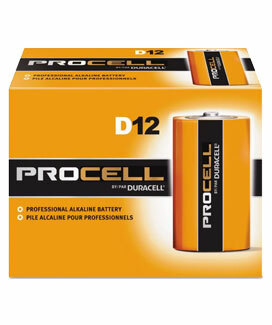 Duracell Procell D cells are high quality alkaline batteries that are specifically designed for heavy use in industrial environments. Each Procell D battery features an incredibly high 15000mAh capacity that will keep your vital work tools running longer than the competition. These batteries come date coded to guarantee freshness, and are ready for immediate use or for long term storage thanks to an impressive 7 Year Shelf Life. The highest quality battery for use in workplaces or job sites, Duracell Procells are sure to help you get the job done.